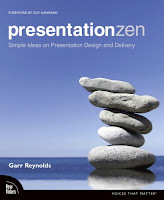 If there was ever a book I wanted to read on the art of presentations, it was Garr Reynolds Presentation Zen. Before sharing with you what Presentation Zen is, I would like to tell you what Presentation Zen is not. What is Presentation Zen then? It is a new approach to the art of presentations. It is a collection of Garr's wisdom gathered over time. It starts with a realization that something is wrong with presentations today. And after having realized that, you improve by investing time and effort. During my journey through its 225 pages I gathered a lot of wisdom. Some of it I am sharing with you today. If you want more, I strongly recommend you to buy Presentation Zen. Like any great book, the essence of Presentation Zen cannot be drawn from a single reading. Everytime you read it, you will learn something new. The very reason you are reading the book is that you want to become a better presenter. You can only become better if you realize that there is something wrong with your presentation style today. Everyone else is also on the same page and hence to become better you should be ready to take your own path. Be ready to break the rules! Go against the norm. "Restraint in preparation, simplicity in design and naturalness in delivery." When you are preparing for your presentation you should decide on your presentation objective and work towards achieving it through appropriate content, design and delivery. Presentations are not made to impress others. However they are great opportunities to differentiate yourself and your organization and increase your business success. Before you open you PowerPoint slides take a step back, look at the overall objectives and think about the parameters within which you are operating. How much time do you have? Where is the venue? Who is your audience? What are their expectations? What do you want to share with them and Why should they listen to you at all? Once you have figured out your core message, you start planning on a whiteboard or with paper (analog mode). It helps you get the bigger picture and plan out the flow properly. Only after you have everything planned out should you open the slides and start typing. What do we mean by design? Garr belives that design is not decoration. Simplicity in design implies removing any non-value adding elements from the slide and the presentation. Choosing images which take your point further. Taking care of the aesthetics of the slides. Aiming for simplicity in everything we choose in our presentation; from the kind of template to the use of charts and graphs. The simpler the design the more is the understanding. Naturalness in delivery teaches us to be our true self and present in the present. Forget the past mistakes you might have committed, forget the future (whether you will fail or succeed). Be lost in the moment just like an artist while playing music. Presentation is an art and you are the artist. Where the book ends, your journey begins. Not many will begin their journey after reading Presentation Zen. Many who start will lose focus on the way. The one who works hard will make it to the end.